Vegetables feed the body, flowers feed the soul…. Dahlias are some of the most beautiful flowers one can grow. At first, they might seem intimidating, but they are not much more difficult than other flowers you might grow in your garden. Dahlias are a bushy, herbaceous plant native to Mexico. Dahlias produce tubers (part of the root system) which were originally grown by the Aztecs as a food source similar to modern day tapioca or cassava. Dahlias also belong to the same family that includes flowers such as sunflowers, daisy, chrysanthemum, and zinnia. Dahlias are annual plants in most regions and are normally sold as tubers for planting. While they can be grown from seed, the plants those seeds produce will not be the same as the parent. Each seed may produce a plant with similar traits as its parents, but each is genetically unique. 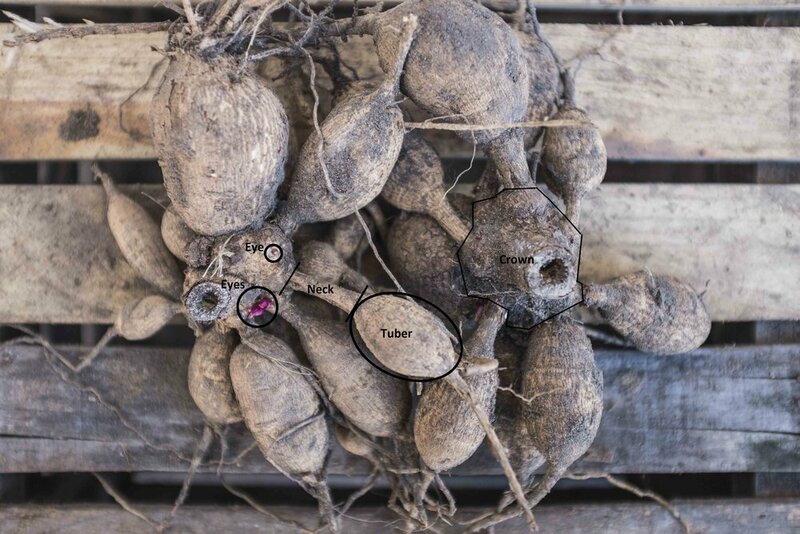 Tubers, however, are clones of the parent plant and will resemble the plant they came from. Dahlia tubers need to be stored in a cool, but not freezing and high humidity environment through the winter months. The tubers should be planted in full sun and well-drained soil with lots of organic matter after the risk of frost is over. Make sure you do not over water dahlias after they are planted. They need very little water until the plants are at least 6”-12” tall. As dahlias grow it is best to stake them so they to not fall over in the wind. After 12-16 weeks they will start to produce flowers and will continue to do so all the way until your first frost. The best way to extend the vase life of dahlia flowers is to make sure you keep them in clean water. 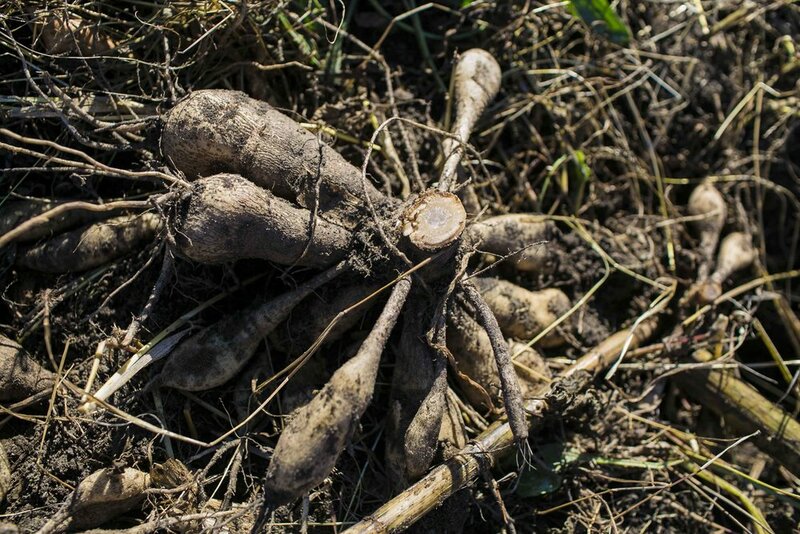 In the fall, after the plants die back, you can dig up the dahlia’s tubers to store them for another year. For an in depth review on dahlia tubers and splitting, check out our blog on the topic! When you first receive your tubers, they will most likely resemble a single, small sweet potato. A tuber is a starchy body that provides water and energy to the plant in its early stages of life. This part of raising dahlias is the one that most people struggle with as it is a balance of keeping dahlias at the correct temperature and humidity. In nature, dahlia tubers would over winter in cool, but not frozen soil. The goal when you are storing tubers is to try and mimic these conditions. Dahlias form “eyes” at the crown or shoulder of the tuber. This is the area of the tuber where the stem formed on the plant from the year before. Until eyes start to emerge, it can be difficult to identify where they are located or if there are any. Most dahlias require temperatures above 55 degrees Fahrenheit before they will start to form eyes. Different varieties will also produce eyes sooner than others. For example, the variety Just Peachy forms eyes after about three weeks at 60 degrees while the variety Nicholas can take six to eight weeks to produce its first eyes. When we split tubers on the farm, we are normally splitting before eyes are present. Many people, however, wait to split their tubers until the spring when they see eyes forming on them. The key to splitting dahlia tubers is to make sure they you are leaving enough area on the crown of the tuber for an eye to form. Our rule on the farm is to leave around one cm² (about half a dime) of the crown attached to a dahlia when splitting. This will leave enough area for an eye to form around 90-95% of the time. On our farm we use pruning shears to divide dahlias. It is also important to make sure you are regularly cleaning your splitting tools as they can become a vector for spreading disease between plants. When storing dahlias, they need to be kept in a cool, but not freezing environment at a relatively high humidity. If your temperature is too high, you risk your dahlia tubers sprouting and growing prematurely. If your temperature is too low, you risk your dahlia tubers freezing. If your humidity is too low, you risk your dahlia tubers dehydrating, causing them to shrivel. If your humidity is too high, you risk your dahlia tubers rotting or getting moldy. The ideal environment to store your dahlia tubers is 38˚-45˚ F and at 70%-80% relative humidity. Mold will naturally form on dahlia tubers in high humidity environments. If you see mold on your tubes there is no need to panic. First, move them to a drier environment. This will stop the grown of the mold on the exterior of the tuber. If the mold is on the outside of the tuber, you can brush it off with a paintbrush or toothbrush. If the mold had penetrated inside of the tuber, you can cut and throw away the infected area of the tuber and let it cut end dry off. Unless very small (smaller than a little finger), cutting away ¾ of the tuber will not affect the growth of the plant. This is an example of a mold growing on a dahlia tuber. This fungus (Penicillium a.k.a. 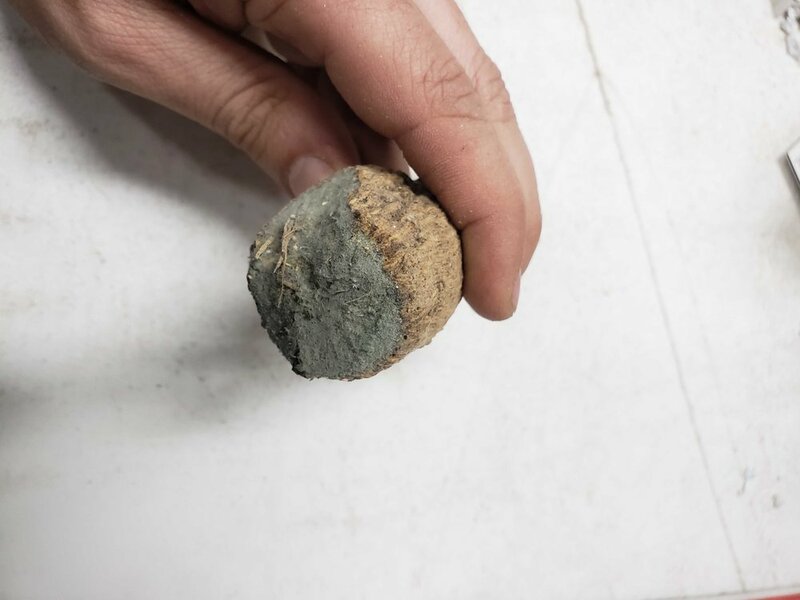 bread mold) is normally superficial and can be treated by moving the tuber to a drier area and brushing off the mold. Unless it penetrates the tuber, it will not affect the plants growth. There are many ways people store their dahlia tubers. Some place dahlia tubers in vermiculite or some other substrate and place in a cool part of the basement or garage. Others will wrap cleaned dahlia tubers in a plastic wrap after they split them. We suggest you practice using several different methods and find what works best for you, keeping in mind the temperature and humidity you want to keep them at. Dahlias tubers should be planted in the spring after the risk of frost. The earliest varieties of dahlias take about two weeks before you will see a sprout. The latest can take up to 8 weeks to emerge after planting. Dahlias also prefer to be grown in full sun, although you can successfully grow them in areas that receive sun 75% of the day. They can be grown in pots but make sure you are using a container large enough for the plant. Most varieties should be grown in a 5 to 7 gallon pot. An example of planting a dahlia at 8" spacing in a single row. It is best if soil temperatures are above 55˚ F when planting. In addition, your soil should be moist, but not wet. Just like when storing dahlias, if there is too much moisture around a dahlia tuber, they are likely to rot. In most cases, you don’t need to worry about watering dahlias until they are at least 6”-12” tall and over watering at this stage can actually inhibit strong root growth. When planting dahlias, it is important to allow them enough space to grow. Some varieties can become quite large and planting too close can cause plants to not receive enough light or air flow which can lead to mildew issues later. We plant our dahlias at a depth of 4" in the ground. If you are planting an especially large tuber, you can go a little deeper. Dahlias should be planted on their side with the eye facing up. If there is no eye visible at the time of planting, you can just place the tuber in the ground lying flat and the eye will find its way to the surface. When planting in a single file row, you can plant as close 8”. When planting in a double row, it is best to stagger the planting and we recommend planting at 10” spacing. When doing a triple row, it is again best to stagger the planting and plant at 10” spacing. For walking paths around your flowers, it is good to leave at least 45” between rows of plants. When the plants are full size, you will have a hard time walking down your paths if they are planted any closer. Dahlias like to be grown well drained and slightly acidic soil with lots of organic matter. Dahlias can be very difficult to grow in clay soil and in those conditions do best in raised beds or in amended soil to help with drainage. If your soil holds standing water for more than 24 hours after a heavy rain, it is normally a good sign of poor drainage. You should always take a soil test before applying fertilizer and only apply what you need to for your plants. Never fertilize just for the sake of putting down fertilizer. Over fertilizing plants can cause environmental issues, hurt your plants, and it is a waste of money. For help getting and interpreting a soil test, you can contact your local Extension agent. When looking at any fertilizers, you will see three numbers. The first is for Nitrogen (N) the second is for Phosphorus (P) and the third is Potassium (K). The numbers represent what percent content of each of these nutrients. For example, a fertilizer that reads 10 – 25 – 30 contains 10% N, 25% P, and 30% K by weight. While they do require nitrogen, too much can cause the plants to be poor flower producers. Dahlias perform best when planted in soil that contains around 220 lb of phosphorus per acre and 250 lb of potassium per acre. You should also have a slightly acidic soil although dahlias can be grown in soil with a PH up to 7.5. Since dahlias can grow to such a large size and they have a relatively shallow root system, it is often required that you should stake them. When only growing a few dahlias most people either tie them to a bamboo stick as they grow taller or use tomato cages. 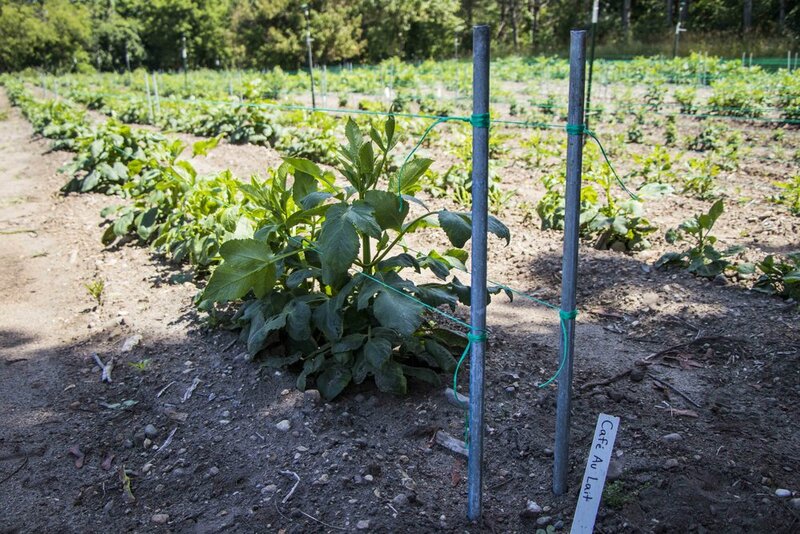 When planting in a row, you can also run strings on either side of the row supported by anchor posts at the end of the row to prevent the plants from tipping over. An example of corralling dahlias planted in a row. Some people like to pinch their dahlias when growing them as it can produce a bushier plant with more stems. This is normally done by cutting the plant after the 3rd or 4th leaf set. Deer normally will not bother dahlias if there are other food sources available to them. The major pests for dahlias are insects such as aphids, thrips, Japanese beetle, cucumber beetle, and earwigs. Additionally, there are several fungal issues you may experience on your dahlias. There are many conventional and organic methods of controlling these pests as well as natural controls such as traps, removing by hand, or biological alternatives. Whenever using a pesticide, organic or conventional, you must follow label instructions. Not doing so will cause environmental harm and is a Federal offense. The most common fungal issue you may experience is Powdery Mildew. The prevalence of this can be reduced by not using overhead watering as it occurs when the leaves of plants are damp. On our farm, this normally is not present until the end of the season and we normally do not need to treat it as the flowers are at the end of production. For specific answers regarding pests, it is best to contact your local Extension agent. Dahlias can take anywhere from 12 to 16 weeks to bloom after planting. Once they start blooming, they will continue to bloom until first frost. How many flowers a single plant will produce depends on the variety. Generally, varieties that produce smaller flowers will produce more flowers. Normally you can expect anywhere from two to five flowers per week per plant. It is best to pick your flowers earlier in the morning when temperatures are cooler. You also want to pick dahlias when they are fully in bloom or just before. Unlike many other flowers, dahlias will not continue to open much after picked. After your flowers are picked, you can expect them to last anywhere from 3-7 days if they are kept cool and the water is changed daily. Clean water is the best thing that you can do to maximize the life of your dahlias. Changing the water daily and keeping it clean is key. In general, the larger the flower, the shorter its vase life. Your dahlias will continue to grow until you receive your first frost. After your first frost or in mid-October or later (whichever comes first) you should cut back your dahlias to slightly above ground level and dispose of the tops of the plant. 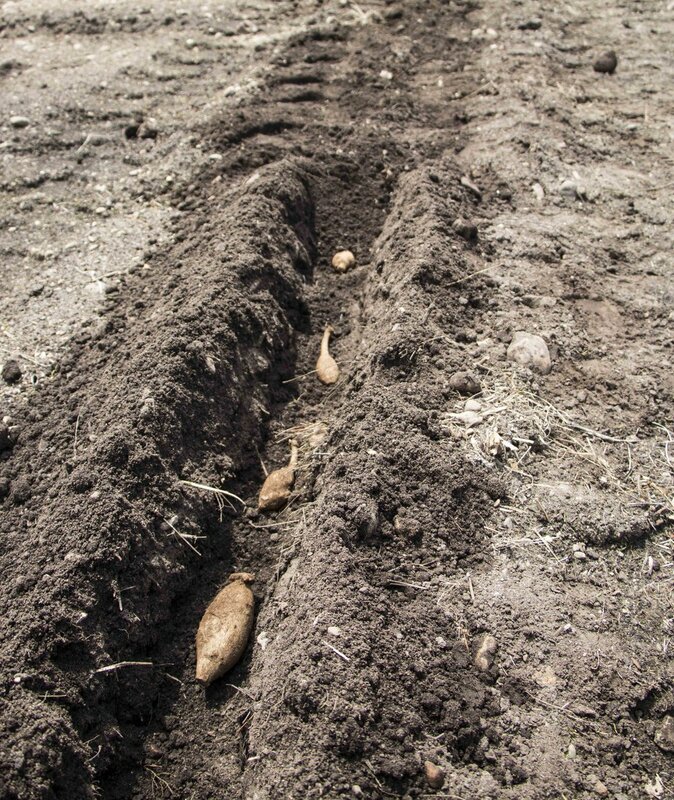 We like to let our tubers sit for a time in the ground before digging to harden them off but if you are out of time due to the ground being very wet and/or below freezing temperatures, you can dig right away. When digging your tubers, you want to dig wide and deep around the stem to avoid damaging the tubers. This is usually at least 12” away from the stem. After they are lifted, you should gently remove as much of the soil as you can, taking care not to break the necks (the thinner area between the crown and plump body) of the dahlia tubers. If the neck is too damaged, this breaks the connection between the tuber and its future eyes and the plant cannot grow. If you have made it this far, congratulations! It can sound a little overwhelming, but this is a detailed review of the entire process. At the end of the day, the best way to learn is by trying, so give it a shot! We promise that dahlias are some of the most amazing flowers you will ever see and there is nothing like the satisfaction you will receive from growing your own! If you are looking for more information, the American Dahlia Society has many great resources to reference.